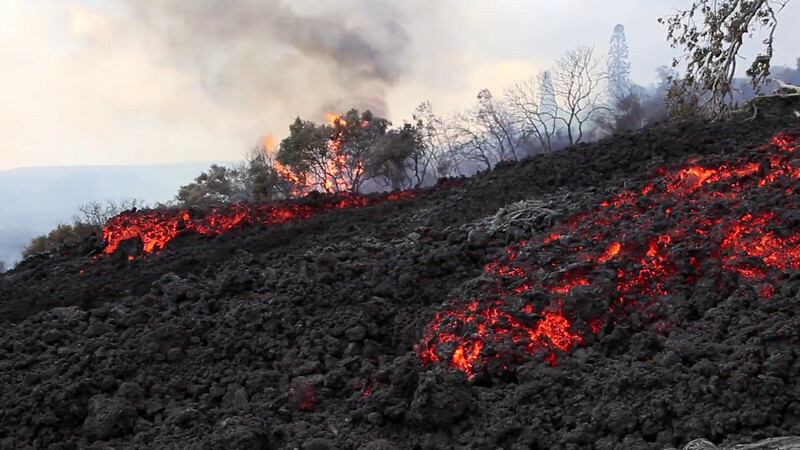 -- A high-resolution remastered documentary containing and amazingly broad range of lava action. Production companies looking for a cross-section of molten lava footage for your movie's storyline should simply scrub through the movie, then contact me to arrange for more lava clips or purchase information. A fast moving molten lava flow ploughs into a Big Island Hawaii forest, coming so close to a home the owner had to be airlifted to safety by helicopter. That home is the last one still occupied within the original Royal Gardens subdivision, a once large community set up on the steep slopes of the Pulama Pali four miles west of Kalapana Gardens,. Unfortunately, Royal Gardens was built four miles directly below Pu`u O`o -- a very active and prolific lava producing volcano. Molten lava spewing out of that crater first began destroying sections of the subdivision streets and homes as far back as the mid-eighties. As the years went by more lava flows sliced through the area, more homes burned and all access roads were obliterated... except for Jack's street and his beautiful hand built home setting in an old lush forest. Jack Thompson chose to remain living there even though the forests around him have shrunk to being a green patch on the side of a mountain of raw, rough, gray lava fields. So in this short video, the helicopter you see rising out of the burning forest, fronted by flowing lava, is Jack being taken out of the path of the inferno. The lava was very close to Jack's home when I shot this footage, but as of this writing, pilots claim his house still remains standing, as rivers of lava slice another swath of trees and streets bordering his property.